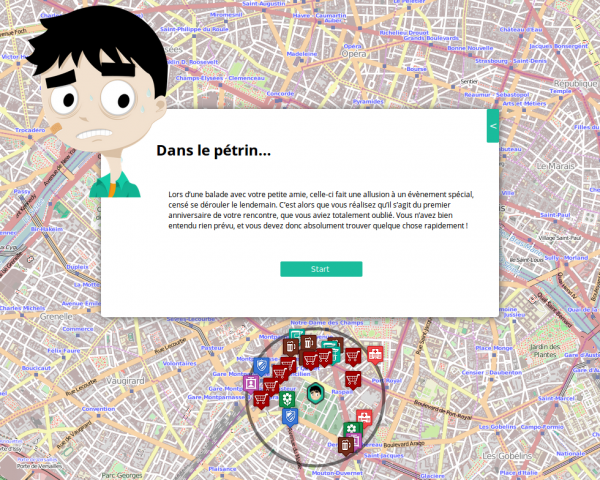 Dans le pétrin is a game developed for Cartoviz 2014 by Florian Mopin, Hippolyte Lenfant, Rémi Lopes, Valentin Richard, Antoine Beauvillain, Baptiste Trouillet and myself. It is a role-playing game where the hero has to find a gift for his girlfriend by going through Paris. You can try one of the latest versions by clicking here. You found an error in this article? Some advice? You can send a comment by email to "blog at killiankemps.fr" with "[Comment][en][Dans le pétrin]" as subject.